Salbutamol Sulphate 100 micrograms Inhaler is a pressurised inhalation suspension (inhaler), which contains the active ingredient salbutamol (as salbutamol sulphate). 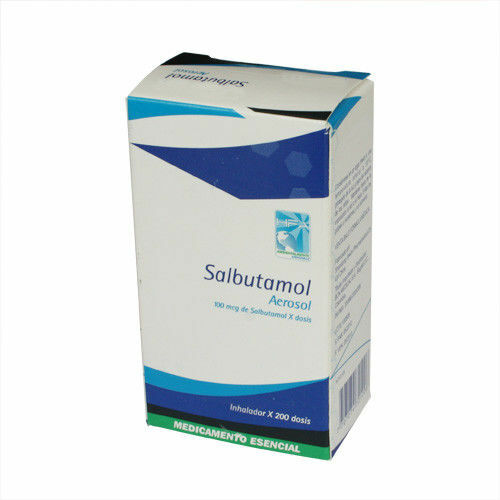 Salbutamol belongs to a group of medicines called short-acting B2 agonists, bronchodilators or "relievers". Salbutamol acts directly on the muscles in the walls of the airways in the lung causing the muscles to relax. This widens or opens up your airways making it easier to breathe. Norflurane (HFA 134a) - this is a hydrofluoroalkane, non-chlorofluorocarbon (non-CFC) propellant; this product does not contain CFCs. We have high automation degree producing line to make sure each product have same quality and specification. For symptomatic relief and prevention of bronchospasm due to bronchial asthma, chronic bronchitis, and other chronic bronchopulmonary disorders such as COPD. Salbutamol (INN) or albuterol (USAN), a moderately selective beta(2)-receptor agonist similar in structure to terbutaline, is widely used as a bronchodilator to manage asthma and other chronic obstructive airway diseases. The R-isomer, levalbuterol, is responsible for bronchodilation while the S-isomer increases bronchial reactivity. The R-enantiomer is sold in its pure form as Levalbuterol. The manufacturer of levalbuterol, Sepracor, has implied (although not directly claimed) that the presence of only the R-enantiomer produces fewer side-effects. Salbutamol is a beta(2)-adrenergic agonist and thus it stimulates beta(2)-adrenergic receptors. Binding of albuterol to beta(2)-receptors in the lungs results in relaxation of bronchial smooth muscles. It is believed that salbutamol increases cAMP production by activating adenylate cyclase, and the actions of salbutamol are mediated by cAMP. Increased intracellular cyclic AMP increases the activity of cAMP-dependent protein kinase A, which inhibits the phosphorylation of myosin and lowers intracellular calcium concentrations. A lowered intracellular calcium concentration leads to a smooth muscle relaxation and bronchodilation. In addition to bronchodilation, salbutamol inhibits the release of bronchoconstricting agents from mast cells, inhibits microvascular leakage, and enhances mucociliary clearance.